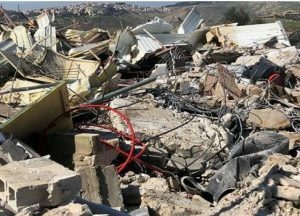 Israeli soldiers demolished, on Wednesday morning, a Palestinian home, hair salon and a barn, in occupied East Jerusalem, after the army alleged they were built without permits, yet, the families did not receive prior warnings. 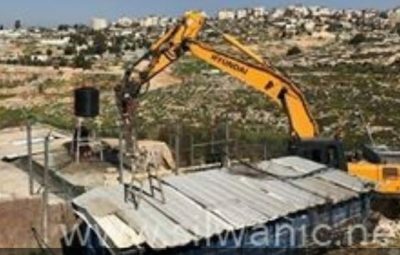 Many army jeeps and bulldozers, in addition to police officers and workers of the City Council, invaded Shu’fat neighborhood, after isolating it, and demolished a home and a barn, owned by Saleh Abu Khdeir. Abu Khdeir told the Wadi Hilweh Information Center in Silwan (Silwanic) that his home was 115 square meters, and was built in 2006, but he and his family were only able to inhabit it in 2012, after completing all the needed work and furnishing. He added that the City Council issued the demolition order in October 2017, but Abu Khdeir managed to obtain a court order halting the demolition until further deliberations are held, but the soldiers went ahead and demolished the property. The Palestinian also previously paid two fines of a t otal of 50.000 Shekels. In Beit Hanina, north of Jerusalem, the soldiers invaded al-Ashqariyya neighborhood, and demolished a hair saloon for women, owned by Daoud Moheisin. Moheisin said that his wife ran the salon, which was only 30 square meters.